The most basic spring brake control function are “quick release” and “anti-compounding”. The illustration at the right shows how a Bendix QR-1C accomplishes both of these functions with an important link to the service relay circuit. The next most important function is the “modulation” of the spring brakes to provide limited braking function in the event of the failure of the service brakes. Modulation requires an alternative source of air pressure which is provided by the SR-1 valve which is linked to the secondary air supply reservoir which is shown below. For tandem axle trucks the QR-1C valve is not capable of controlling four spring brakes and so in the example below an R-14 valve is used. 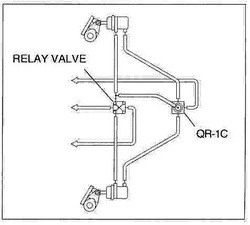 The R-14 is identical to an R-12 relay valve but it has the equivalent of the QR-1C built in. Note that the SR-1 valve is still required. All of the above spring brake control functions are finally combined into the Bendix SR-7 valve shown below with the PP-DC valve which is the device that has always been required to set the parking brakes. Neither an SR-1 nor a QR-1C is required.